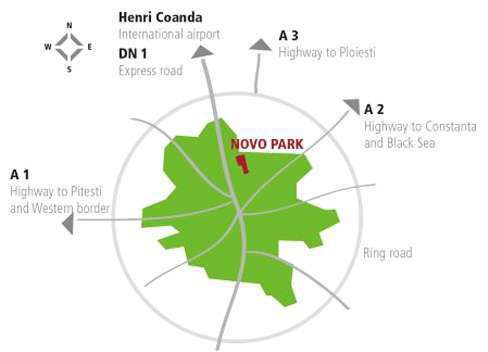 Novo Park is located in the North of Bucharest, in the Pipera district, the most dynamic area for office spaces. easy access to the main National Roads: A1 Highway – the main link to the Western border; A2 Highway – the main link to Constanta and the Black Sea; A3 Highway and DN1 – the main link to Prahova valley. The office complex offers access points from both Dimitrie Pompeiu Blvd and Fabrica de Glucoza Street. Tramway lines directly connecting the Eastern, Western and Southern parts of Bucharest.